To most of you the idea of making stock on Thanksgiving Day seems just a little bit crazy. Whether it's you that does all the cooking or not; after having spent the day with family and friends the thought of making stock is probably the furthest thing from your mind. Let me share with you why it shouldn't be. Making stock is actually quite easy. Step back for a minute and think about the day before T-day or even the morning of...you are already prepping carrots, onions and celery for something; I'm sure of it. As you do, take all of the discarded pieces such as the ends of your carrots and the tops of the celery, and save them in a plastic bag. When you make your stuffing, clip some extra rosemary or whichever herb you prefer and toss it into the bag. Trimming the extra fat from your turkey; into the bag it goes. Fast forward; the turkey is out of the oven and waiting to be carved, the drippings are being turned into a delicious gravy and the pan is sitting idle. This is where you swoop in, grab your plastic bag of trimmings, add them to the resting pan along with some water and on the stove it goes. Once the turkey is carved you add the carcass and Voila you are well on your way to making stock and you haven't even had dessert yet. Simmer for a few hours, stirring occasionally and skimming any of the scum that forms on the top (this is normal). 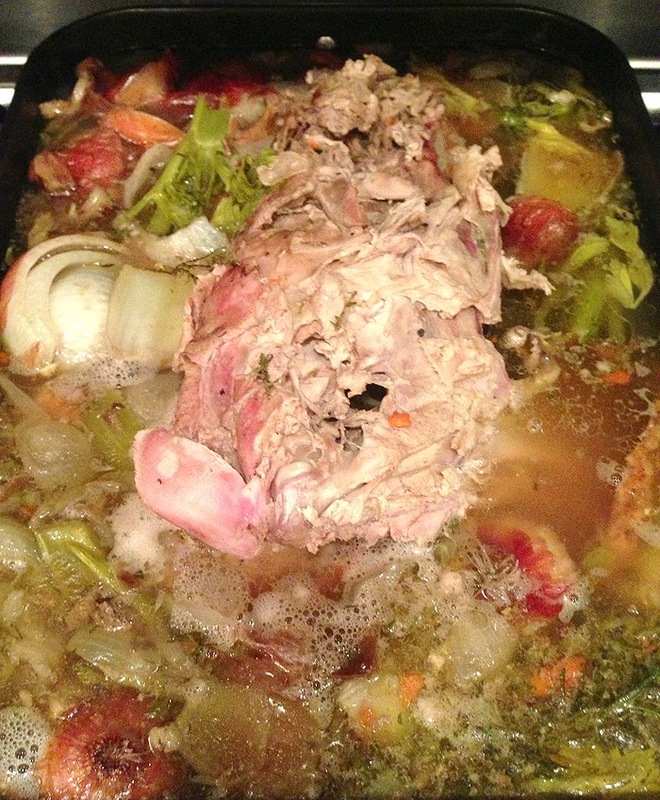 After about 3 hours; remove the bones and all the vegetables. Strain the stock making sure to get rid of any little particles, divide into containers and refrigerate over night. In the morning skim the layer of fat that has congealed; at this point you can use immediately or freeze for another time. Making stock really is easy and shouldn't be something you shy away from...try it this way and let me know what you think. THANK-YOU! I've been doing this for 30 years and my wife still thinks I'm nuts. From childhood she was used to seeing the whole(ish) carcass sitting in the fridge for 4 or 5 days, slowly shrinking, before somebody got around to making the inevitable soup or goulash (right when everybody was so sick of turkey even the smell of the stock cooking wasn't appealing - let alone actually wanting to eat the finished product). She still gives me a hard time about it but because I can magically extend the precious turkey gravy by a half gallon the next day, she's learned to accept it. Bonus upsides... The broken-down turkey takes up MUCH less room in the fridge AND breaking the bird down allows it to chill WAY faster, making it that much safer from a food-born-illness point of view. Preaching to the choir here, I suppose. Thanks again.